We're not talking much about presents to my son for Christmas. He was spoiled for his birthday in October and didn't really understand the whole concept. The magic of Christmas is already quite fun for him, between finding the Elf every morning, opening a new window of his Playmobil advent calendar and all the light shows and Christmas adventures. That being said, I did do some head scratching when it came time to figure out what to get him. He is getting books, of course. We buy him books all the time and will take any opportunity to buy him even more books. 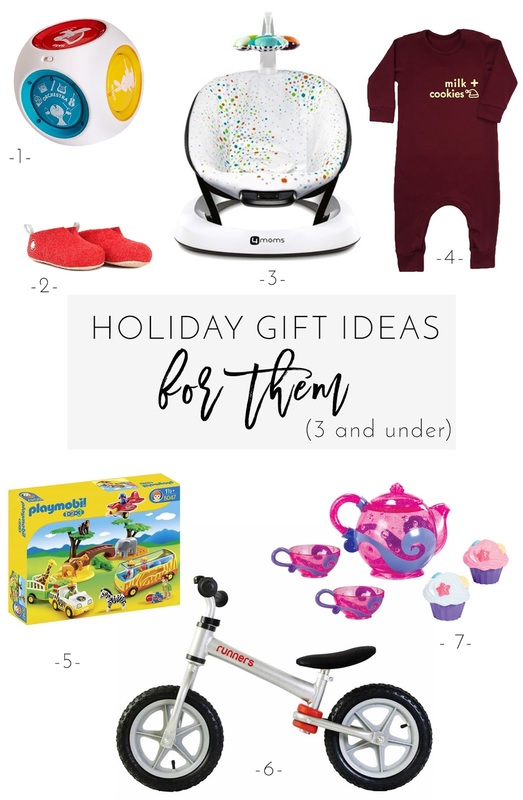 I came up with a few ideas and here are some of my picks for children and babies under 3. -1- The Mozart Cube - I haven't tried it or heard anything about it really, but it sounds like it would be entertaining for both my son (2) and his little bff (my best friend's son, 5 months). Children love musical toys, so might as well go with pretty classical music, am I right? -2- I mentioned those Baabuk slippers here and couldn't resist slipping (ha! pun intended) them into the kids' gift guide too. They are just so cute, and you can customize them! -3- Okay, this is technically a gift for new moms, but it's for the babies too, right? The Bounceroo is the famous Mamaroo's littlest brother and retails for half the price. Whoever you gift this too shall be eternally grateful. -4- How cute is this romper from the Whimsical Fox? Seriously. I want it for my son, for every baby I know and maybe even one for myself. -5- I grew up playing with Playmobils and we bought my son his first Playmobil 1.2.3 Advent calendar. I love that they have the 1.2.3 line for toddlers to play freely and let their imaginations loose without the choking hazards. -6- Raise your hand if you've never wanted a bike for Christmas. This lightweight aluminum model will be perfect for my busy little guy. My parents may or may not have arranged for Santa to deliver this one under our tree. -7- Pretend play is an important development stage and the only spot my son will truly play for hours is the bath. He love to pretend he's making daddy's coffee so I thought this little bath time tea set would be the perfect present.